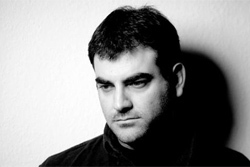 The mastermind behind Phobos Corp is Greek keyboard player Spyros Papadakis. With a handful of collaborators, and one being suspiciously named Tara, the female lead vocalist, Papadakis delivers his first EP Felicity. Phobos Corp's Spyros Papadakis: appearing pensive in black and white. Put this short disc in the category of symphonic, melodic, and progressive metal akin to a blend between Ayreon and Rhapsody of Fire. Papadakis draws heavily from traditional metal and film scores, citing Hans Zimmer as a major influence. Basically, this material is epic, extravagant, and often bombastic. But it's not necessarily a synthesizer festival, and for that we should be grateful. No, Phobos Corp's compositions offer well-rounded depth from the stunning vocals from Tara to the orchestral arrangements to the stirring guitar solos. Spyros is equally principal, composer, and player in the band. And every song here is premium material, with the intriguing prog nuances of Conceived Fate and the majestic instrumental Angels in Despair the cream. Press material suggests Papadakis is working on a second Phobos Corp EP for late 2012. Frankly, I say let's have an LP full of his fine creations. We need more. Strongly recommended. Phobos Corp's Felicity is epic and entertaining symphonic and melodic metal with prog nuances. There just needs to be more of it.